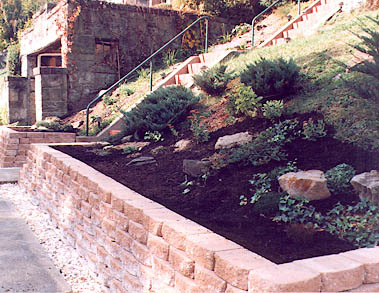 First on the list of exterior projects was to begin to tackle the weedy front hillside. 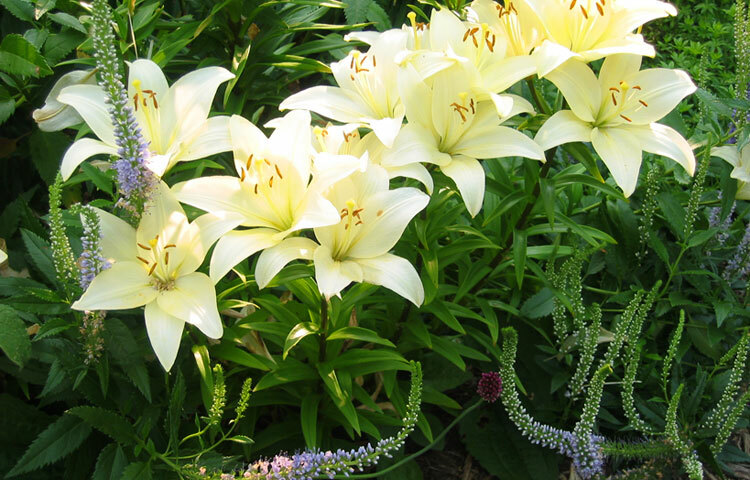 The first summer we tried to pretty it up by planting oriental lilies and planting grass to control erosion . We soon found out that cutting the grass was a difficult and dangerous chore so our strategy quickly became one of removing all of the grass as soon as possible. We removed the hedge row at the bottom of the hill, and began hand excavating for a wall that would contain the erosion and immediately give the house a fresh look. 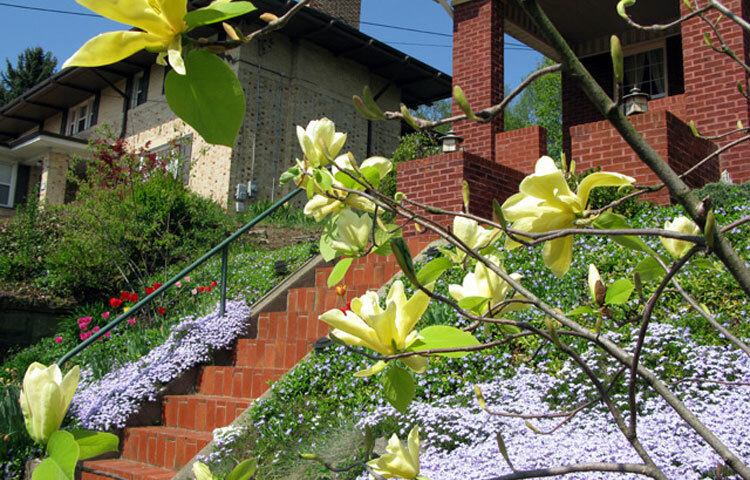 Over the next two years we gradually removed the grass and planted a variety of creeping plants such as phlox and perrywinkle, and perennial flowers and added to the landscape by placing rocks gathered from nearby construction sites and woodlands. 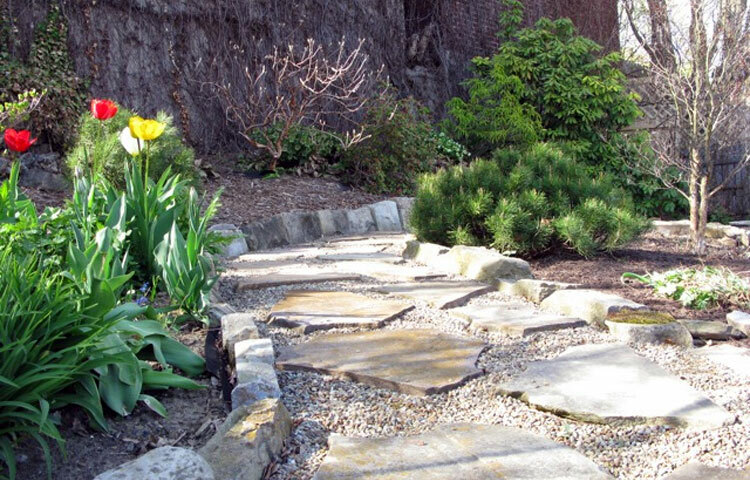 The transformation was dramatic and the hillside blooms with snowdrop and crocus in February/March, daffodils, tulips, and rock cress in April/May and over a dozen daylilies throughout the summer. Sedums give color right through November. 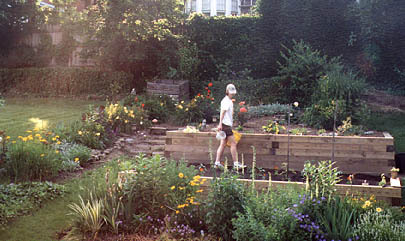 The back yard consisted of a level area extending 12 feet from the house and stairs leading to the sloped upper yard. The yard was steep enough to make it pretty much useless for anything. 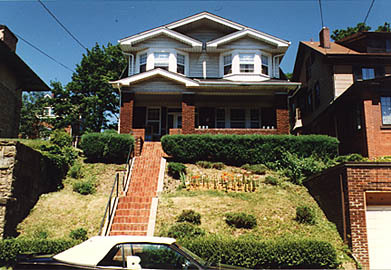 The previous owner had planted six Eastern Hemlock trees along the left and had lopped of the tops of all of them to keep them at about 7 feet high. 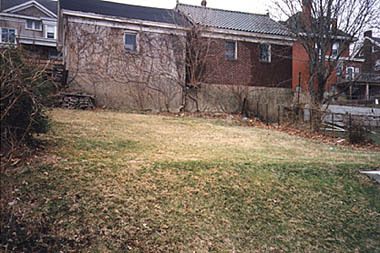 Grape vine cover the cyclone fence on the right and Virginia creeper vine covered the garages belonging to people on the next street over which formed the rear boundary of the yard. 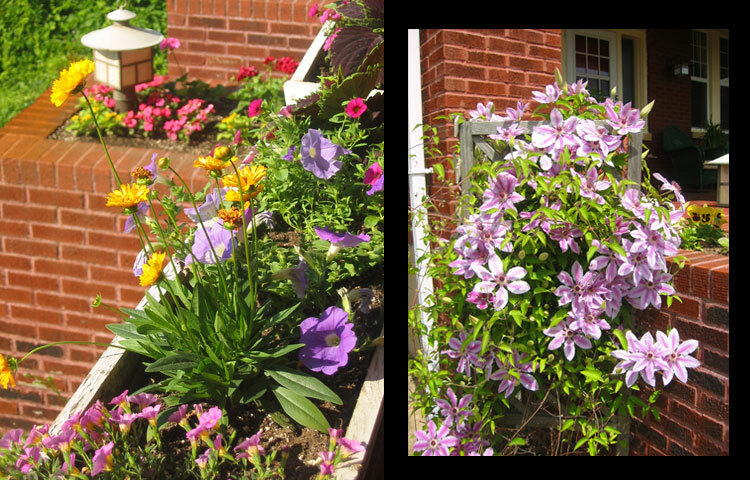 Still, we were determined to make the yard a showcase garden no matter what it took. 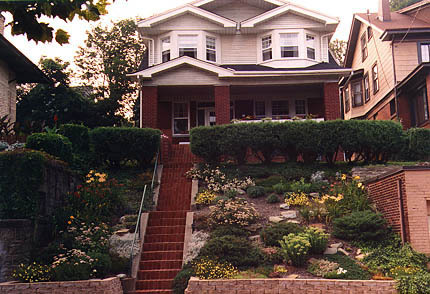 The house had no rear access so everything from 8-foot-long 6x6 landscaping ties, concrete block, gravel, top soil and mulch, had to be carried up 25 steps from the street and around the side of the house where we still had to move the supplies up the sloping back yard. 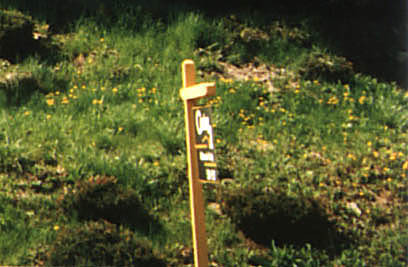 Who needs exercise when you own a house on a hill! 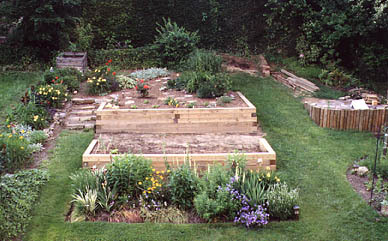 The first spring we created our a small vegetable garden at the rear of the yard while we decided how to landscape based on sunlight patterns throughout the summer. 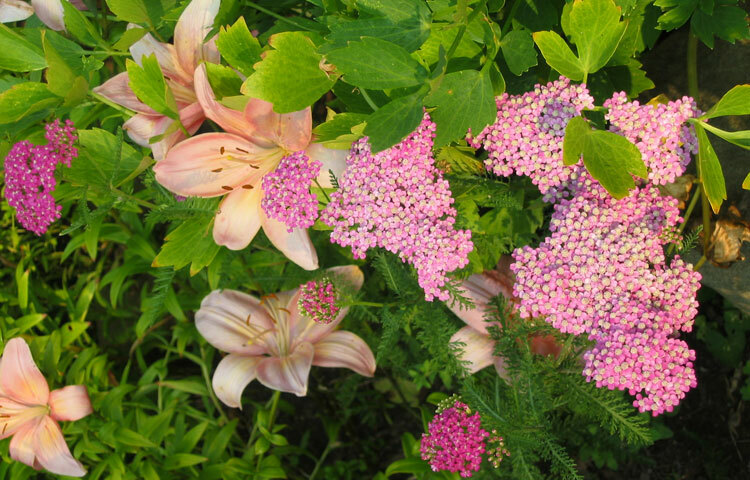 We decided that a small woodland garden consisting of rhodedendron, columbine, lady's mantle and sweet woodruff would work at the rear against the ivy-covered garages. 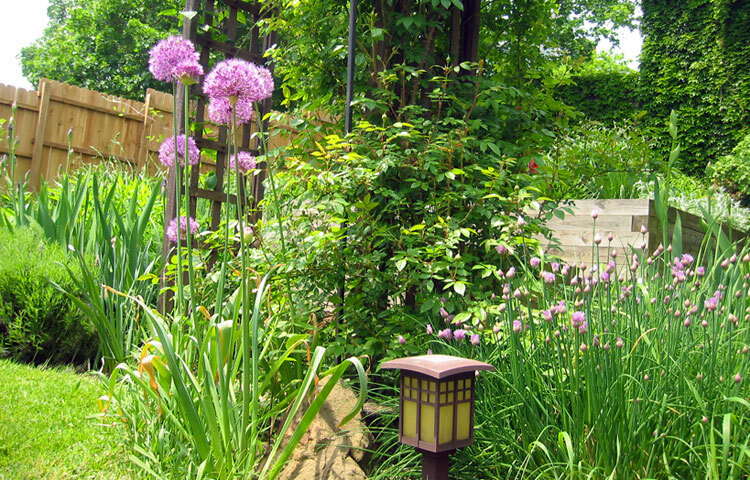 Other shade plants like hostas, ferns and astilbe would work well against the side of the house. The rest of the yard got partial to full sun. 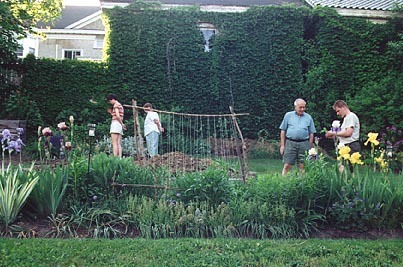 By late summer we were plotting out the first of many gardens. The next year I cut down the hemlocks and began digging additional plots (while my inspired neighbor roto-tilled his entire back yard to level his land a bit). 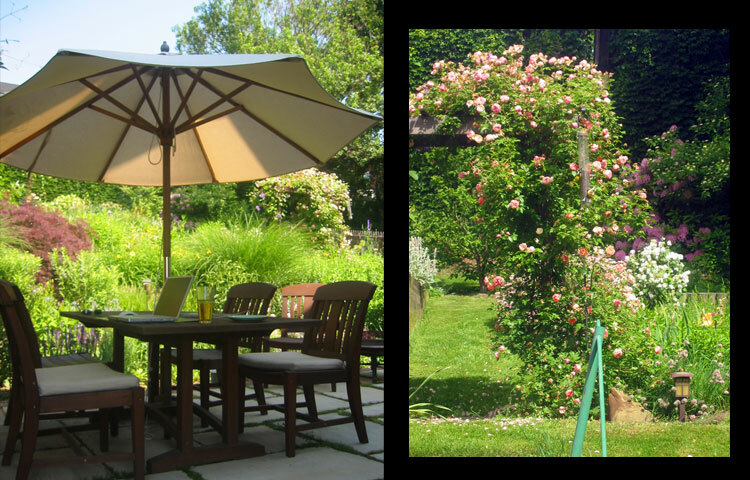 We worked using a vision rather than a master plan and after only a couple years the yard had already come alive with flowers. 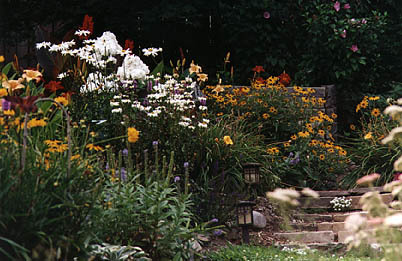 Within three years, we had created a left-side border with roses, phlox, stella doras, veronics, Russian sage, and black-eyed Susans. 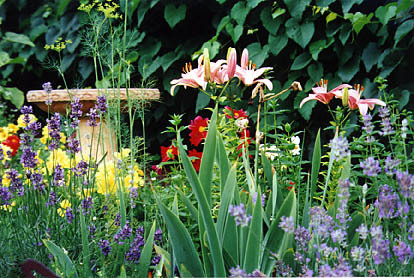 A front garden with a blue and yellow theme consisted of iris, lilies, grape hyacynth, tete-a-tetes, yarrow and asters, was accompanied by a new vegetable garden behind it. 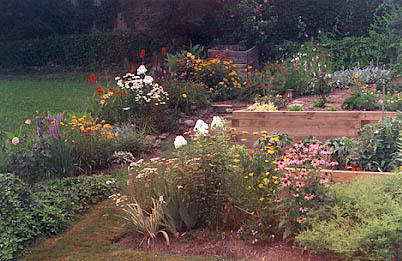 We filled the old vegetable garden with tulips, poppies, stella doras, lamb's ear and silver mound. 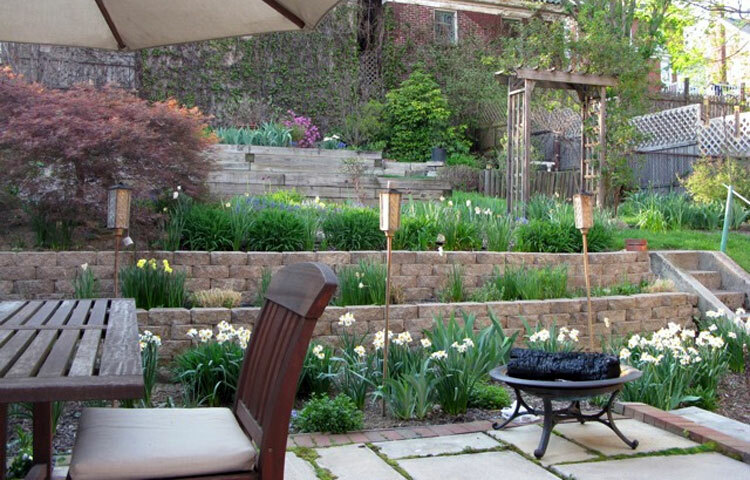 We hadn't anticipated on building so many walls, but terracing quickly became a necessity. The soil needed amended badly and we needed some sort of wall to hold the top soil we brought in. 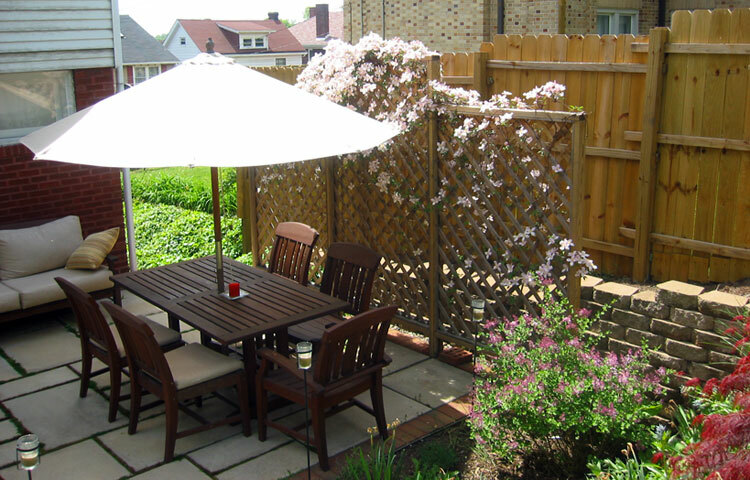 In addition, part of the vision included creating a patio with pergola on the flat are next to the house. 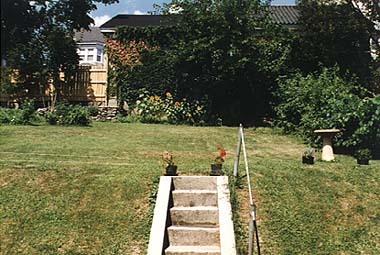 But after four years I was tired of cutting the steep hill leading to the upper yard. 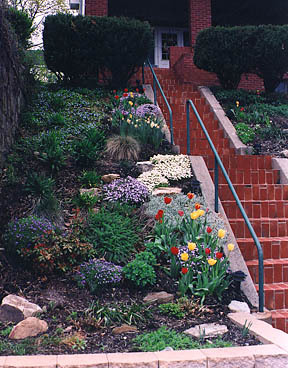 I decided to cut three feet into the hillside and build a retaining wall that would eliminate grass cutting on the left side of the steps and give me more land for the patio. 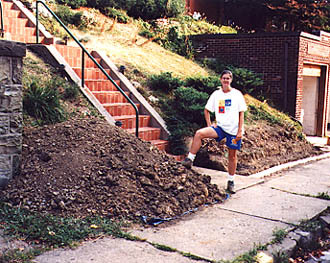 The question quickly became: what to do with all of the dirt in the huge pile I was creating. There was no way I was going to take it to the front of the house and down 25 steps. 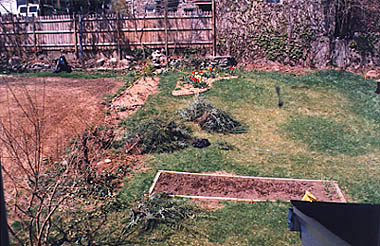 It was hard enough wheel barrowing it up to the upper yard, but that's what I did, and that's how my patio project was side tracked two years while I built two additional walls in the upper yard to hold all the excavated dirt. 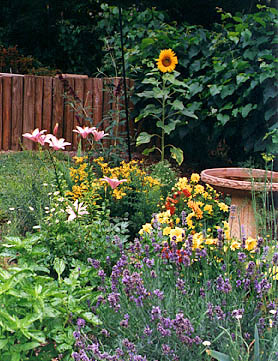 Photo: My backyard with phlox, cone flowers, coreopsis, yarrow, and rudbeckia.